After Intel announcement developing of the 3D memory ship named Hybrid Memory Cube (HMC) with seven times energy efficiency than current DDR3, IBM and Micron today announce their project of building a 3D memory using a multilayers technology putting layers of DRAM and connected by vertical conduits known as through-silicon vias or (TSVs). The new technology will lead to 90 percent reduction in a memory chip's physical footprint, a 70 percent cut in its energy consumption, a radical increase in bandwidth and may be a low cost per MB compared to the 2D DDR3 technology. The TSVs (Through Silicon Vias) that IBM is laying down in its manufacturing technique are copper, and integrate nicely with the high-k metal gate processes that Big Blue uses to make the embedded DRAM on its Power7 and System z10 processors. The technique can obviously be applied to standard DRAM – and in fact, Micron is using IBM's technique to make the TSV interconnects that will lash together its own DRAM chips. The HMC logic circuits underpinning the cubes will be made using IBM's 32-nanometer high-k metal gate process from its East Fishkill, New York fab. These logic circuits will be shipped off to one of Micron's 300mm fabs in Boise, Idaho, where they will be mated with stacked memory modules and their TSV pipelines etched by Micron. By stacking the DRAM chips in a 3D cube, the real estate in a server or PC can be significantly reduced or the memory capacity or bandwidth can be significantly increased – we all vote for the latter, of course. 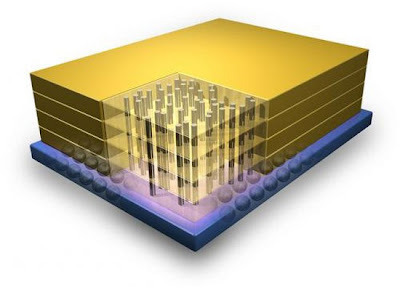 IBM and Micron say that HMC devices can take up about a tenth the space of traditional 2D DRAM memory sticks and require 70 per cent less energy to transfer a bit of data from the memory chip to the CPU. The best part is that the HMC prototype modules that have been manufactured to date can deliver around 128GB/sec of bandwidth into and out of the memory block using DDR3 memory chips, compared to 12.8GB/sec for 1.33GHz DDR3 memory sticks made in a conventional 2D layout. The HMC consortium, which includes Altera, Open Silicon, Xilinx, and now IBM, has gotten some love from Intel recently, as well, but it seems unlikely that Intel will re-enter the memory market is exited decades ago.